Park Address: Monument Valley Navajo Tribal Park, P.O. Box 360289, Monument Valley, Utah 84536. There is only one main road through Monument Valley, US 163, which links Kayenta, AZ with US 191 in Utah. Approaching the AZ/UT border from the north gives the most recognizable image of the valley. 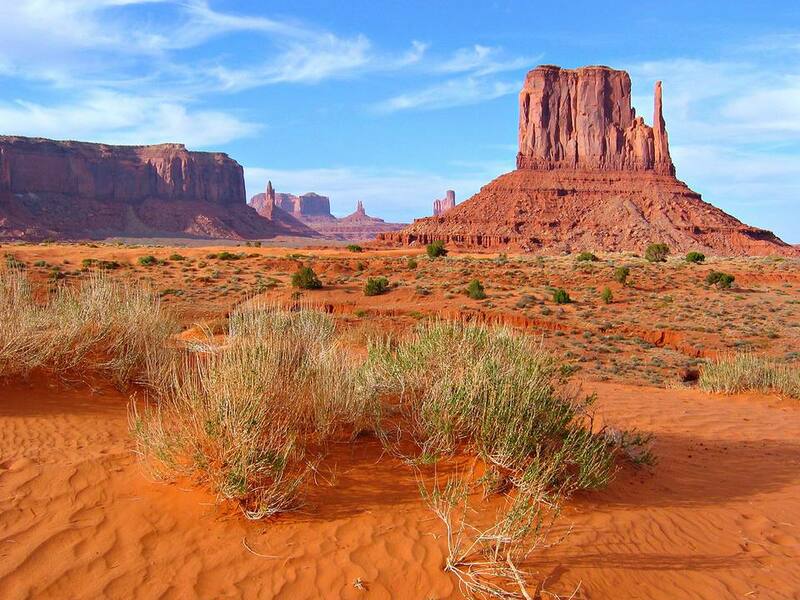 Monument Valley is about a 6-hour drive from Phoenix and less than 2 hours from Lake Powell. We drove to Canyon de Chelly the first night, stayed in Thunderbird Lodge and then headed out to Monument Valley the second day. That’s a good way to go for a more comprehensive and restful trip if you are traveling from Phoenix. Everyone is familiar with the signature rock formations of Monument Valley but when you spend time there, you will realize that there is so much more to see and experience. Monument Valley is not a State or National Park. It is a Navajo Tribal Park. Navajo families have lived in the valley for generations. Learning about the Navajo people is just as enjoyable as touring the monuments of the valley. On all of Simpson’s Trailhandler Tours, your Navajo tour guide will share with you his knowledge of the geology of Monument Valley, and the culture, traditions, and heritage of his people: the Dineh (Navajo). Stop at the Visitors Center- The Visitor’s Center and plaza overlook the valley. There are restrooms, restaurant, and well-stocked gift shop. Go through the various exhibits of the Navajo Nation, Navajo Code Talkers, and the area's history. When you approach the parking lot at the Visitors Center you will see all sorts of tour vehicles – jeeps, vans, and trucks. You also will see a small wood building where you can sign up for horseback tours. You can (although we wouldn’t recommend it) drive your own car into the valley. Take a tour. You will learn so much from the guide and will have a chance to talk with a Navajo person, most likely from the Valley. You will have choices so decide how long you want to stay (there are overnight packages where you stay in a hogan) and what you want to see. Then talk to the tour operators and see what meets your needs. Simpson’s has a website so you can get an idea of what types of tours are offered. If you are a photographer, a great time to go is in July or August during the monsoon season. You will have more clouds in the sky and may even capture a bolt of lightning. Views in the valley are striking during the time of the setting sun or before dawn, as the sun rises behind the buttes, silhouetting them against a dark blue and then pink sky. Sunset from the Visitor’s Center is also a great opportunity to capture Monument Valley at it’s best. A 17 mile mapped drive will lead you into the middle of the monuments, and you will pass some extremely photogenic spots along the way. We highly recommend taking a tour of the monuments and winding your way through the Valley. There are treasures to see at every turn, and some of them are not on the tourist map! In order to see Monument Valley at its quietest and most atmospheric, an overnight stay might be a wonderful experience. The new VIEW Hotel is open and the views, as you might suspect, are amazing. Simpson’s has overnight packages where you can stay in one of his relative’s tourist hogans. There is a campground at Mitten View with 99 sites including RV sites. In places like Monument Valley, the night sky is clear and very impressive. The constellations are visible and it feels like you can reach up and touch the Milky Way. At most of the main sightseeing stops through Monument Valley, you will find tables and stands set up with jewelry and pottery for sale. If you want an inexpensive souvenir, these stands are great places for your purchases. Dicker a little. It isn't considered rude. For more collectible items, head for the gift shop at the visitors center. There is some beautiful jewelry, rugs as well as the usual tourist stuff. Monument Valley is part of the Colorado Plateau. The floor is largely silt stone and sand deposited by the meandering rivers that carved the valley. The valley's beautiful red color comes from iron oxide exposed in the weathered siltstone. The wearing down of layers of soft and hard rock slowly revealed the monuments that we enjoy today. Many movies were filmed in Monument Valley. It was a favorite of producer, John Ford. Archaeologists have recorded more than 100 ancient Anasazi sites and ruins dating before A.D. 1300. Like other areas in the region, the valley was abandoned by the Anasazis in the 1300’s. No one knows when the first Navajo settled in the area. For generations, however, Navajo residents have herded sheep and other livestock and raised small quantities of crops. Monument Valley is a small part of the nearly 16 million Navajo Reservation, and its residents are but a small percentage of the Navajo population of more than 300,000.